As demand for a greater guest experience increases, Samsung’s slim-designed HE460 Series displays revitalize in-room entertainment by enabling hotel managers to create and share clear content that addresses a range of guest needs. The embedded LYNK REACH 4.0 allows for remote, centralized and efficient display management through a single remote control center. Hotel managers can customize guest viewing experience and reinforce branding and cost-effectiveness through an enhanced Home Menu that allows guests to view essential hotel information. Recently updated to include a value-added feature such as improved Plug-and-Play capabilities, the HE460 Series displays enable hotel managers to activate hundreds of in-room displays with minimal effort by synchronizing multiple displays and servers in a simple way. LYNK REACH 4.0 is upgraded to accommodate existing LAN, WIFI and coaxial infrastructures to streamline hotel management. LYNK REACH 4.0 deploys personalized guest messages options of hotels, expands content delivery and facilitates two-way communication between hotel management and guests. User interface templates to deliver essential information can also be accessed, while in-room displays can be managed through a remote control center. Deliver a wide array of content to guests with an enhanced Home Menu that does not require the additional purchase of a solution or network infrastructure. New enhanced home menu enables hotels to welcome guests with a brief video clip along with the hotel logo before offering live TV. Guests can conveniently view resources such as the time, date and hotel information, and access frequently used TV features in user mode. Provide a safe and cost-effective alternative to traditional hardware-based content protection systems using Samsung LYNK DRM technology. The solution allows encrypted live channel and VoD content to pass securely and display on hotel TVs. It also reduces the need for additional equipment and provides quicker recovery for Conditional Access System (CAS) problems. To help ensure system reliability, coverage extends to the enlargement of head-end equipment for cable operators. Give guests the luxury of listening to TV in bed without the cumbersome need to extend the headphone cable. Headphone ID detects when a pair of headphones is connected to the extension sockets next to a bed and switches the audio output to avoid disturbing others in the room. Utilize uniquely strong content management with Security Mode. With this feature, you can block critical functions of the displays, such as USB Cloning, to easily prevent changes to the displays' settings. You can also block non-compliant content or the transmission of unwanted Teletext (TTX) to maintain complete control of content on guest room displays. 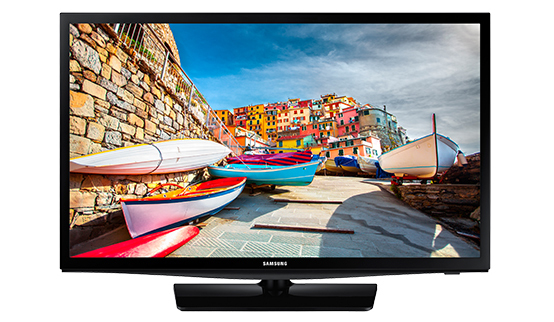 Pairing a Samsung Hospitality TV with a Sound Bar creates a truly high-end media environment. Connected by a High-Definition Multimedia Interface® cable, settings are automatically applied, making installation a breeze, and the universal remote gives guests full control over the entire system. Eliminate annoying interference from other remote signals, such as hotel fitness centers, where multiple TVs are in close proximity. The multi-code remote can control up to 10 TVs individually in the same room. With ConnectShare™ Movie, guests simply plug their USB stick or hard drive into the TV, allowing them to instantaneously view and share movies, photos and music. Content comes alive on the screen with excellent picture quality. Hotel managers can adjust the channel mix for both analogue and digital signals without the need to edit channel lists for different TV systems. The hotel can reorder and rename channels to make channel mapping easy and intuitive. 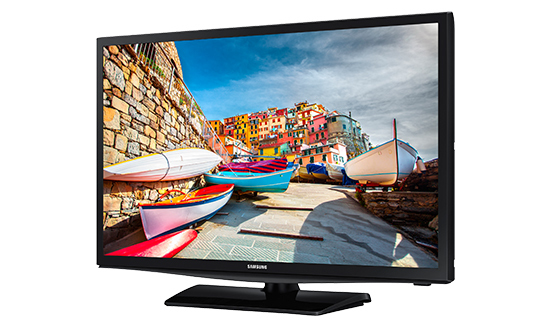 Allow your guests to check the current time on the TV whenever needed. Software Clock allows guest to check the time just by pressing the “Info” button, even when the TV is off.